A great 'first Sony MP3 player' for younger music lovers, the compact, colourful WALKMAN® NWZ-B150 series offers great sound with pumping bass you can really feel. The built-in USB connection links WALKMAN® directly to your computer with no cables or extra software needed: just drag and drop to load up your favourite tracks. The direct USB connection also allows easy music transfer and direct recording or playback with compatible Mini/Micro audio systems(2). If you're in a hurry, a 3-minute charge gives this Sony MP3 Player enough power for 90 minutes listening, while a fully charged battery offers up to 18 hours(1) non-stop play time. Optional accessories for the WALKMAN® NWZ-B150 series include the CKA-NWU10 sports armband -- an ideal addition for keeping Walkman® secure while you're exercising or just hanging out. 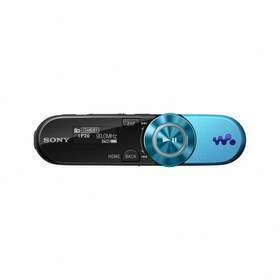 The WALKMAN® NWZ-B150 series is part of the full line-up of MP3 and MP4 players by Sony. The WALKMAN® range includes the high-performance X series with touchscreen and Digital Noise Cancelling technology; the ultra-slim A series with wide 7.1cm (2.8") OLED screen; the S series with built-in speakers; the compact, great-sounding E series; and the wearable W series for sports. The new WALKMAN® NWZ-B150 Sony MP3 player comes in a range of colour variations black, blue, pink and red and is available from early June 2010. (1) 18 hours of music playback with MP3 files at 128 kbps, screen on 'Save ON Super', sound effects: Equalizer 'None', Bass: Deactivated, Power Illuminator: 'LED OFF'. (2) Available only with Audio Systems which have both USB Mass Storage Management Function and Ripping and/or Up-Streaming Function. "Sony", "WALKMAN", "VAIO", "Cyber-shot", "Handycam", "a", "BRAVIA" and "XDCAM" are registered trademarks or trademarks of Sony Corporation. All other trademarks or registered trademarks are the property of their respective owners.